Electoral democracy allows us to vote a dictator into power. Free, fair, and competitive elections do not always guarantee that politicians with deepest commitments to democratic values always win. As we witness the so-called political earthquakes all over the world in the past few years, one could not help but wonder whether the demos, at least for now, demands a dictator. There are many ways to answer this question. But we must remember that politicians neither fell from the sky nor sprouted from the earth. They came from our homes, communities, and society. We empower them as the representatives of our own visions of the public good. In this essay, I draw on the Asia Barometer Survey (Wave 4) to reflect on the seeming rise of illiberalism among Filipinos. I argue that at the root of Philippine illiberalism is the equation of stability with the absence of opposition, and this equivalence in turn is based on the relationship between disempowered citizens and the spectacle of an apparently chaotic and ineffective circus of elites. The succeeding sections dissect illiberalism in terms of its anti-institutional, anti-pluralist, and leader-centric dimensions. Data analyzed in this article were collected by the Asian Barometer Project (Wave 4 – 2013-2016), which was co-directed by Professors Fu Hu and Yun-han Chu and received major funding support from Taiwan’s Ministry of Education, Academia Sinica and National Taiwan University. The Asian Barometer Project Office (www.asianbarometer.org) is solely responsible for the data distribution. The author appreciates the assistance in providing data by the institutes and individuals aforementioned. The views expressed herein are the author’s own. First, most of the respondents disagree with the notion of abolishing representative institutions and the rule of law in favor of a strong leader, military rule, or during times of crisis. From the table above, the results to Q130, Q132, Q133, and Q149 indicate a weak anti-institutional tendency. This, however, is qualified by the results to Q146 suggesting a tendency to approve of a strong executive in relation to the balance of power (i.e. its relationship with the legislature). For 56.4% of the respondents, the system of checks and balances between executive and the legislature may be detrimental to the capacity of the former to “accomplish great things”. Thus, though they have weak anti-institutional tendencies, most are attached to the ideals of a strong executive. In relation to the latter point, the measures for leader-centric tendencies (Q142, Q147) elaborate on the notion of strong presidents on two accounts. First, though majority of the respondents does not consider government leaders in a paternalistic manner, most of them agree with the notion of giving absolute authority to leaders who they consider as morally upright. From this seemingly contradictory result, we can deduce that a want for a strong executive is based on moral uprightness as a standard for having authority. Regarding anti-pluralism, 64.3% of the respondents perceive the multiplicity of ways of thinking as a threat to social harmony (Q148). Furthermore, 59.1% of the respondents prefer government control over ideas circulating and forming within the polity (Q143). These results are qualified on two accounts. On one hand, 71.3% of the respondents disagreed with the notion of a single-party state (Q131). This must be understood further in the context of a political arena constituted by weak political parties based on patron-client relations than on strict party discipline. On the other hand, 50% of the respondents disagree with the notion of organisational plurality as a disruptive social factor (Q144). How can we explain this form of illiberalism? What facilitates the juxtaposition of intolerance and a morally driven attitude towards leadership with an unwillingness to abandon political institutions? 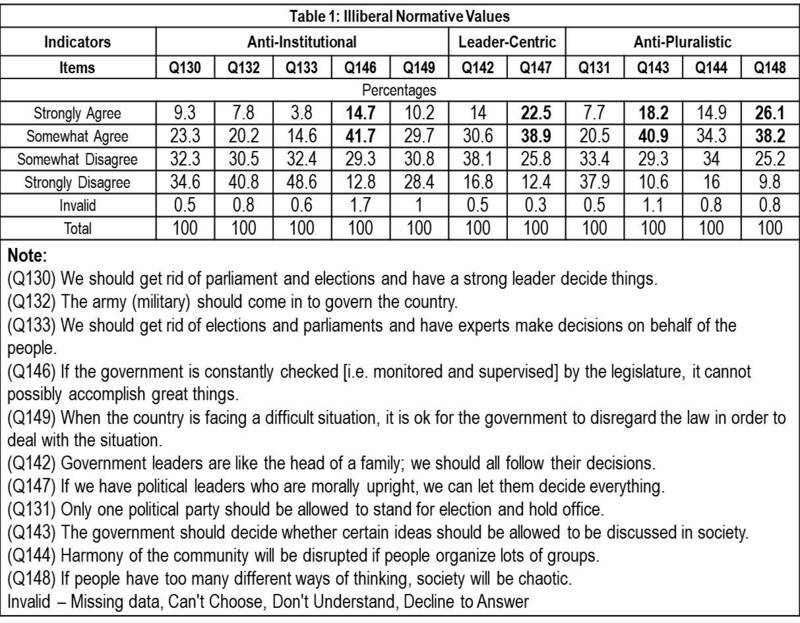 Also, to confound this issue, I note that most of the respondents also expressed distrust towards government institutions. Why is there a seemingly schizophrenic condition wherein citizens are unwilling to abandon representative institutions that they distrust? Answers can be found in the political relations underlying the persistence of such values. Specifically, the relations citizens perceive and evaluate during their regular exposure to the public sphere. To elaborate, we can surmise that Philippine illiberalism is based on equating of stability with the absence of opposition. This is based on citizens taking institutions as the embodiment of stability while turning to agency in understanding the political woes of the country. Simply put, personality politics suspends institutions from an equation that takes agents as both the cause of, and solution to social problems. This explains the willingness to empower those who can be deemed as morally upright while sustaining representative institutions. However, in order to explain their aversion to opposition, we must look further at the publicised dimension of personality politics. Representative politics is a spectacle, projecting not only individual engagements ranging from shouting matches to outright violence, but also portraits of the public sphere itself. They see their own dis/empowerment through it. From this point intolerance can be traced, on one hand, to a narrative wherein opposition leads to stagnation, if not regression. Opposition, based on this view, is an obstacle to “progress”. On the other, the image of a public sphere that is nearly, if not wholly impervious to civic action outside elections ties intolerance to the ballot. The result is that citizens rely on elections as their means of empowerment. Moreover, the isolating force of the individual ballot sustains intolerance. It excuses citizens from engaging with unlike-minded people. Consequently, this political spectacle sustains the need to authorize a leader who can achieve stability by ending opposition. The intolerant votes with the hope of resolving a problem that he cannot solve himself. To conclude, we turn to the notion of protest vote as an act of criticism against the status quo and/or a specific administration. In the context of illiberal values, this can be further defined as an expression of a need to eliminate opposition in public affairs. It is a demand to end politics itself. The dangers of this form of illiberalism is that it lends the political system vulnerable to autocrats taking power. This condition implies a shared vision for a state wherein institutions are run in silence by virtuous men. Neither a faceless bureaucracy nor a dynamic public sphere. Nevertheless, complex reality exposes the dangers of repression underlying the pursuit of this ideal. Thus, in pursuing it we end up getting the leaders we deserve like a toxic person trapped in a self-destructive path.